The City Plan Commission will review a proposal to rezone 195 Parcel 42 to allow for the construction of a residential tower, known as Hope Point Tower, by the Fane Organization of New York. Parcel 42 is currently zoned for 100′ with bonuses allowing up to 130′. The proposed rezoning would allow for a building of up to 600′. The City Plan Commission meets this afternoon at 4:45pm at the Providence Public Safety Complex on Washington Street. The Providence Preservation Society has grave concerns about this proposal which is to be sited on the northern portion of Parcel 42 (and part of P4 – a planned public park) in the I-195 Redevelopment District. 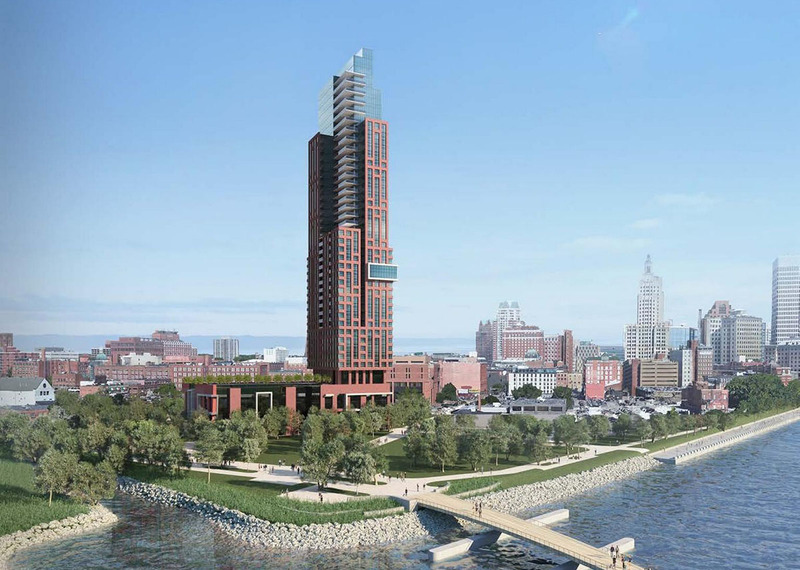 This proposal is currently known as Hope Point Tower, but we believe it will decrease HOPE for Providence if our elected leaders allow it to be built on that location. This proposal fails to meet existing development and design guidelines set forth by the City and the State. It is wrong for Providence. This proposal, which has been proven to be financially unfeasible is diverting time and resources from the construction and redevelopment that Providence is currently experiencing. It is distracting from key issues of economic growth, job creation, affordable housing, and long-term environmental sustainability. Why are we spending time on this when deserving and realistic projects can’t secure funding or attention they need? There are more than 60 projects awaiting historic tax credits, but the General Assembly doesn’t support that type of incentive. It requires SPOT ZONING. The current maximum height is 130’, per the 2014 zoning ordinance. Spot zoning gives preferential treatment to an applicant seeking a use or form wholly at odds with a city’s zoning ordinance. It also sets a poor precedent and could open the floodgates to other projects in every neighborhood in Providence. If the City Council approves a change in zoning for this single parcel, they are prioritizing a single out-of-state developer over the agency and intent of the people of this city. The SCALE is wrong. The Providence scale that has developed organically over the last three centuries, and which is one of the city’s best attributes, would be compromised and adversely affected. It will overwhelm the park and riverfront, public amenities we have invested in developing over the last several decades. It does not benefit the life of the STREETSCAPE. The planned six-story parking podium, in this location, is detrimental to an active and enjoyable streetscape. What is the PUBLIC BENEFIT associated with such SUBSIDY? The public is asked to give this developer tax incentives (ReBuild RI, Tax Stabilization, Sales Tax Abatement, etc.) yet beyond three years of construction jobs, what is the benefit TO the public? PPS supports appropriate, well-planned, and realistic new development. This type of development should comply with publicly-determined zoning. New development should contribute to an active and enjoyable streetscape. New development should have significant public benefit. This one does none of these things. We call on Mayor Elorza, the Providence City Council, Governor Raimondo and our elected leaders in the General Assembly to reject this proposal and to redirect your energies towards long-lasting job creation, appropriate new development, and redevelopment of cherished icons such as the Industrial Trust Building and the Cranston Street Armory, among others. In my opinion. as someone in the design field and a local employee, I am for this tower through and through. The streetscape will be enhanced, you need people for a true streetscape and the lower retail/building occupants will support that aspect. Once it is built, people will put their differences aside and will observe the beautiful modern architecture, while wishing to someday live in the building. The views will be spectacular, the programming for the local park will be beneficial. It will hopefully support more development of this height, and in the locations between this site, and the Finacial district. It is located in downtown Providence. This tower will be observed for miles. Its a statement tower. I don’t understand this bizarre idea that so many Rhode Islanders have that tall buildings must be constrained to some 5 block radius in “downtown” … This site is literally a 3 minute walk from the Superman building. IT’S ALL DOWNTOWN. Let’s see some changes to the city. Let’s build this and see the positive impact it will bring to downtown. This is so pathetic on the part of the PPS. Short sighted, anti-density, total lack of vision. Why can’t Providence have shiny new skyscrapers? This obsession with low-rise, one dimensional brick structures is just unbelievable. Is there precedent for the PPS to get involved in the discussion for new construction projects? So the main objection is seeing this project get a subsidy over subsidizing restoring older buildings? I can get why PPS would have that stance but all the same I don’t want to see anyone in support of height limits. If someone is willing to build then by all means let the city grow. I’m sure the superman building was a real eye sore to many Providence citizens back when it was designed but we’ve all become accustomed to it and it has become part of the city, just as those waterplace towers have. Let the city grow. I’m about as YIMBY as one can be, but I hate this thing. Why? Because of the parking podium. The end result would be the first five floors containing almost nothing but 400-500 parking spaces. What a lovely thing that would be facing Dyer Street and our forthcoming riverfront park and pedestrian bridge. There is retail on the bottom floors on Dyer street. I personally was taken back by it, but it quickly grew on me. This is the type of architecture that will move Providence towards a new age of development. It’s a good example of the times and of modern architecture and its fresh. One day when (if) this is built, it will represent the style of that time period, such do the other highrises in the city. (art deco, brutalist ect.) It would certainly be impressive. The design almost doesn’t matter. If someone wants to take this kind of risk, fine, but let them do it on their own dime. What’s most annoying to me is that people talk about the jobs this will create like the type of job is irrelevant. We currently have a skilled labor SHORTAGE (https://bit.ly/2DwWDJD), which drives cost of construction up. So basically the city/state would be changing the existing zoning and using our taxpayer dollars to make construction in the rest of the city/region even more expensive than it already is. And to build luxury housing when 42% of owners and 57% of renters in the city are already cost burdened as it is. Same old predictable reaction. Too much, too tall, too big…blah, blah, blah. They point to zoning…yes, that is the issue, terrible small town height restrictions in our downtown! I just don’t get why we are in such a rush to cut off the river from the city again. I love the height, and they can design it however they want IMO, but a building this big in this spot will turn the “waterfront park” into a green walking path. It isn’t a big parcel already, taking half of it for a podium and tower would hardly qualify the rest as a park. Why cant we truly open up the riverfront and develop literally across the street? Every major city in the world has a focus on access to parks and water (central park, Bryant park, west side highway, Boston common, the seaport, the whole London Thames riverfront. San Antonio river walk). Yet here we are after having spend hundreds of millions of dollars to remove the old train yard and the highway looking to put a 6 story parking garage and tower in front of the river. I think the argument against it being tall in general are a bit much, and i think a lot of the zoning rules downtown hurt development but closing off the riverfront again would be a huge mistake.